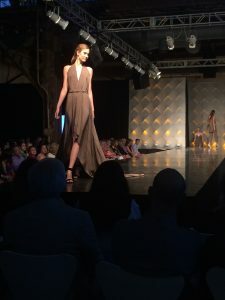 Twenty fashion design students are presenting their senior collections June 4 at the Urban Outfitters headquarters at the Philadelphia Navy Yard. The students have been working on their senior collection since the fall quarter and will have the chance to present them on the runway. Drexel’s fashion design program is nationally ranked within the top 10 fashion programs in the United States. Students in the program are taught different aspects of fashion design including womenswear, menswear, knitwear and swimwear to name a few. For their senior collection students have the opportunity to create their own unique theme — anything that they seek inspiration from qualifies. This year, collection themes and inspirations range from the reinvention of the classic white shirt to Bolivia’s landscape and textiles. In addition to the beautiful collections, the show is also completely run and organized by design and merchandising seniors. The planning and production process for these seniors, led by Olivia Anton, began during the winter quarter. Every student on the team is in charge of a different aspect of the show. Responsibilities include promoting and publicizing the event, casting models, selling tickets and making sure all garments are organized. There will be two shows June 4. The first show starts at 4:00 p.m. and the second at 8:00 p.m. which is followed by a wine and cheese reception. Tickets are currently on sale and can be purchased at Drexel University’s URBN Center as well as online at www.facebook.com/drexelfashionshow. Tickets for the 4:00 p.m. show are $30 and the 8:00 p.m. show are $60.